PennsylvAsia: Mother (마더), Okja, and The Host (괴물) at Row House Cinema's Bong Joon-ho film series, November 3 -9. Mother (마더), Okja, and The Host (괴물) at Row House Cinema's Bong Joon-ho film series, November 3 -9. 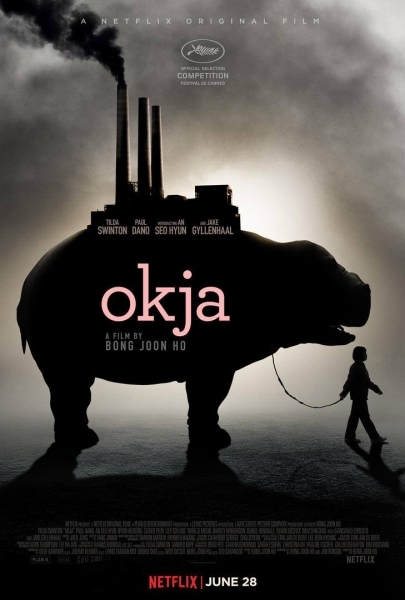 The Row House Cinema presents its first film series by a Korean filmmaker, with 2009's Mother (마더), the 2017 Netflix release Okja, and 2006's hit The Host (괴물) comprising a Bong Joon-ho film series from November 3 through 9. The mother of the title, played by respected South Korean actress Kim Hye-ja, is a force of nature. In a village, she runs a little shop selling herbs, roots and spices. Her sideline is prescribing herbal cures. Her son Do-jun (Weon Bin), in his late 20s, lives at home and they sleep in the same bed. He's a few slices short of a pie. Early in the film, he's saved from death in traffic when his mother races to the rescue. Do-jun has a friend named Jin-tae (Jin Gu). Jin-tae easily manipulates him. Do-jun's mental fogginess may be his most attractive quality. In the town, a shocking murder occurs. A girl's body is left where all can see. A golf ball with Do-jun's name is found near the death site. Okja begins with a splendiferous introduction to its title character. Who is Okja? The ecstatic businesswoman Lucy Mirando (Tilda Swinton) is thrilled to tell us, via multimedia presentation, by revealing to the press and her investors a new kind of “super-pig” her global corporation has discovered. A giant, lumbering beast resembling a hippo (though with a more baleful face), this creature is the future of cuisine, Lucy explains, and Okja is a prized calf sent to a farm in South Korea as part of a worldwide competition to find the best environment for her species. There she’ll roam around the mountains for 10 years, munch on the grass, and becoming a loving companion to young Mija (Ahn Seo-hyun), the farmer’s granddaughter. Park Hie-bong (Byeon Hie-bong) manages a snack stand on the banks of the Han with his son, a bleached-blond ne'er-do-well named Gang-du (Song Kang-ho). Gang-du has a 13-year-old daughter, Hyeon-seo (Ko Ah-sung), whose mother abandoned her at birth. 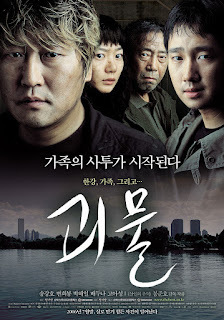 As Hyeon-seo and her layabout dad watch her aunt, Nam-joo (Bae Du-na), place third in a national archery competition on TV, something strange is happening in the river outside. What looks to be a giant, multilegged tadpole hangs upside down from a bridge piling, does a few impressive loop-the-loops under the bridge, and then disappears into the water. Passersby gather to watch, throwing food at the mysterious amphibian. Moments later, in defiance of the monster-movie convention of the slow reveal, the thing is galumphing along the riverbank in full daylight, munching its way through entire trailers full of people. Tickets and showtime information are available at the theater's website. The single-screen theater is located at 4115 Butler Street in Lawrenceville (map).